In a recent interview that Eurogamer published earlier this afternoon, Jon Murphy has accused FIFA of copying. The PES Team Leader also uncovers the strangely-unmentioned but massively important topic of licensing, Seabass' new role at Konami and also talks about the new PES Productions team. For long-time PES fans, this 'news' isn't surprising. However, it's a surprise - for me anyway - to see Jon come out and say something like this. Konami have always been pretty quiet in the past. Finally, before making your judgement, I encourage you all to read the entire article. Whether you prefer Pro Evo or FIFA, I think everyone can admit that Jon makes some valid points, especially when he discusses Konami's licensing situation. "I wouldn't say they are actively doing that right now. I'm saying they have a long history of copying PES to get to where they want to be. People shouldn't forget that's how they got where they are. "You can give them loads of credit for how they've got to where they got to now, and you can see it as a totally valuable product in its own right that does have ideas we can all learn from, but we shouldn't forget that PES innovated all of this stuff and they did copy it. "It's probably gone through a period of intensive care and is now showing full signs of recovery. It's had a massive shot of morphine in its arm, and it's just about to get out of bed and start fighting again. "The sales gap has grown in the UK. That's obvious. It's partly due to the quality of the product, which we've been improving and now stacks up easily against FIFA with this version. But it's also to do with the money spent on marketing and the money spent to lock us out of licenses. "You would hope that with certain licenses, the people who have them would see the advantage of pushing it out to the widest audience rather than keeping it exclusive to one product. "Seabass himself had got to a point where he was perhaps getting a bit frustrated as to how he would take the franchise on. He was right there at the start of development of PES. He was the creator of PES so to speak. "His vision of football games hadn't developed as fast as the machines that could run football games. He had a more traditional view of video games rather than a modern view of video games, which is to do with the sandboxing of games and the rewards that can be offered by that. "He is still working on football for us, is probably the easiest way of thinking about it. Whether or not that's Winning Eleven or PES production stuff, or we've got a whole new IP, or a new system of delivering games, whatever it is, he's involved in our football studio still. As far as the short term goes that is PES anyway. So he's still there with PES. What that turns into later goodness only knows. But he's still there." The PES Team Leader makes some very fair points about the very unfair situation. And unfortunately, given how much criticism they get for not doing something that's completely out of their control, it's unbelievably cruel to see what's happening. Of course, it's always been happening. But it's painful to see how much it's hurting Konami. 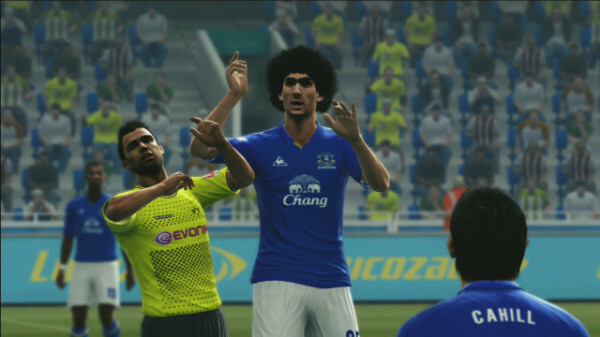 Whether FIFA would cope without licenses, I don't know, we'll probably never know. But it's interesting to see that it looks like; for EA to succeed, they need to block their competitors from acquiring major licenses.